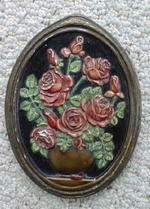 Offering this beautiful old chalkware plaque depicting a vase of detailed red roses and green leaves. Black background, raised frame edge is a dark bronzed gold. Good condition no cracks, one flake chip on back bottom edge, not visible from front. Few tiny chippies which only add to its charm. Perfect for the cottage chic decor! CASE COLLECTOR'S CLUB GENUINE STAG KNIFE (1990) with PLAQUE & COA - 52019. 2. Set of 3 Auto Plaques, Midwest co.